DETROIT (AP) Shohei Ohtani was rolling along for five innings against the Detroit Tigers on Wednesday night. However, thanks to two rain delays, that’s all the Los Angeles Angels got from their young star. ”I just banged – I don’t think it will be serious,” he said. Ohtani walked Martin and Victor Martinez in the first before allowing Niko Goodrum’s two-out RBI single. The Angels tied it in the third when Albert Pujols’ two-out single drove in Mike Trout. Angels: Zack Cozart (forearm tightness) was a late scratch from the Angels’ lineup. . Scioscia said he would talk to Ohtani Thursday morning to decide on his availability to hit in the series finale. Tigers: Detroit put LHPs Francisco Liriano (right hamstring strain) and Daniel Stumpf (ulnar nerve irritation) on the 10-day DL before the game. Liriano’s move is retroactive to Sunday, Stumpf’s to Tuesday. The Tigers recalled RHP Johnny Barbato and LHP Ryan Carpenter from Triple-A Toledo. 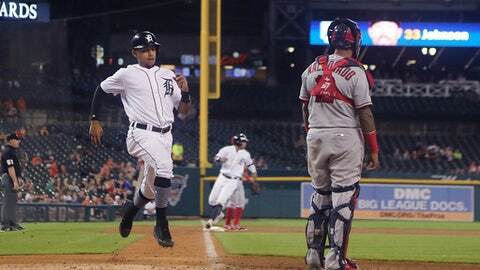 … The Tigers sent Greiner to Toledo after the game and selected the contract of INF Ronny Rodriguez.